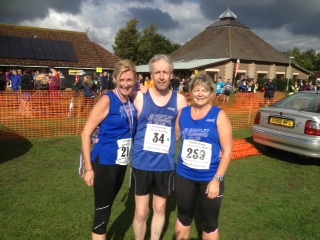 Barry Martin, Rodger Alexander and Charlie Keitch ran the Great Eastern half marathon in Peterborough on the 13th October. Despite the horrible weather conditions at the start, Keitch still managed a pleasing PB in 1:25:23. Rodger Alexander followed in 1:37:38 and Barry Martin 2:11:01. Also run on Sunday was the Tiptree 10, where Eileen Shadford slashed 4 minutes off the PB she set at Mersea during the summer, crossing the finish line in 1:16:03. Weather was also dreadful at the start, but did not stop Kevin Stevens and Jamie O’Neill from getting good times of 1:09:33 and 1:15:03 respectively. The rain held off at the Martlesham 10k, and saw Karen Skene finish in just 48:43, a new PB. Mark Ross finished in 44:12 and Amanda Prior in 1:01. Chris Hayes ran the Speed of Light 5k, part of the Bournemouth Marathon Festival in 29:32.